Single-Family - Judith-Ann Realty, Inc.
Large single family home features a kitchen with small breakfast nook and appliances, an over sized living room with pellet stove, 3 bedrooms and 1 1/2 baths total. Half bath is on the first floor with laundry area in it. 2 enclosed back porches, great yard with mature landscaping and fenced in section and a 2 car garage . Home is a good 203K candidate. Fonda Fultonville schools. Seasonal location in Pine Lake Park! Features include an open kitchen with appliances, dining room and living room, 3 bedrooms and 2 full baths. Very well maintained unit with pressure treated deck and footsteps away from the beach! Beach access is included in the park rent! Fixer upper with some newer features! Home has older kitchen with an updated small computer room off of it and a brand new bath on the 1st floor. Dining room and living room with newer flooring, just could use some paint. Upstairs there are 2 bedrooms and another full bathroom, (updating needed). Some new windows, enclosed front and back porches and the home is vinyl sided. Garage on the property. Perfect starter home is in move in condition. Home features eat in kitchen with new appliances and washer and dryer hookups. Small living room, 2 bedrooms up, (one behind the other), and 1 full bathroom. Home has new carpeting, new windows throughout and a new hot water heater. Home is being sold with 3 lots that total approximately 2 acres of land. All the heavy lifting has been done with this 3 bedroom 1 1/2 bath rehab project. Home is in a great neighborhood and has been gutted to the studs. It has a kitchen with pantry, dining room and living room. Full basement with 2 breaker boxes, new roof and an attached 1 car garage. Exterior painted in 2017. Perfect FHA 203K project! Farmhouse style fixer upper on a large village lot backs up to a wooded parcel. Home has large eat in kitchen with tile floor, living room and 2 bedrooms on the 1st floor. 2nd floor has 1 more bedroom, a full bathroom and attic storage space. 2 car garage, wrap around porch that needs some TLC. Great yard! 1,644 square foot commercial or mixed use house. 1st floor has been used formerly as a dance studio. It has 2 large rooms and a 1/2 bath. Upstairs has a 3 bedroom, 1 bath apartment. Large paved parking lot, full basement and is located in a high traffic location. Situated on approx. 1 acre of land with 144' of road frontage. 1800's Farmhouse with nice deep back yard with mature landscaping and borders by woods. Home is set on 1.03 acres and has an eat in kitchen with oak cabinets and appliances, large living room, 2 bedrooms, (1 up and 1 down), and a full bathroom. Large storage area on the 2nd floor, newer roof and furnace, enclosed back porch, deck off of the back and an attached 1 car garage. Great condition starter home!! Great condition 2008 single wide home set on 1.10 acres, as per deed. Home is bordered by woods and farmland. Inside you will find nice kitchen with dining area and living room with gas fireplace, both with wood laminate floors. Master bedroom has it's own bathroom with soaking tub. 2 more bedrooms and 2 bathrooms, total. Great 2 car garage with workshop and huge 2nd floor loft. Nice back yard with mature landscaping and a perfect spot to sit, relax and watch the wildlife! ​Adorable Colonial style house set on a 40' x 150' lot, as per deed. Home features good sized eat in kitchen with plenty of cabinets and appliances. Formal dining room and living room with fireplace. 3 bedrooms on the 2nd floor and a total of 1 1/2 bathrooms. 2 year old furnace, enclosed front and back porches, a great yard and 1 car garage. Owner looking for an over on this excellent condition Cottage style home in a nice area in the city. Home features kitchen with breakfast bar and appliances, dining room / living room combo with wood burning fireplace, and a nice 3 season porch off the back. 3 bedrooms total, (1 down and 2 up), and 1 1/2 baths. New furnace and water heater, hardwood floors throughout and a nice back yard. Ranch style home situated on an acre of land. Home features eat in kitchen with appliances, dining room, den and living room combo. with fireplace. 3 bedrooms, 2 baths, full basement, sliding glass door to deck on the front of the house, 2 car attached garage and a nice yard. Immaculate Ranch style home set on 2+ acres on a private gravel road off Maple Avenue. Home has an open kitchen with breakfast bar, dining room and living room. Kitchen has dark cabinets with appliances and hardwood flooring. 3 spacious bedrooms with laminate flooring and 1 full tiled bathroom that was just remodeled. Full, clean poured foundation, laundry area in the basement, french doors off the dining room to the back yard that is surrounded by woods. Location can't be beat! 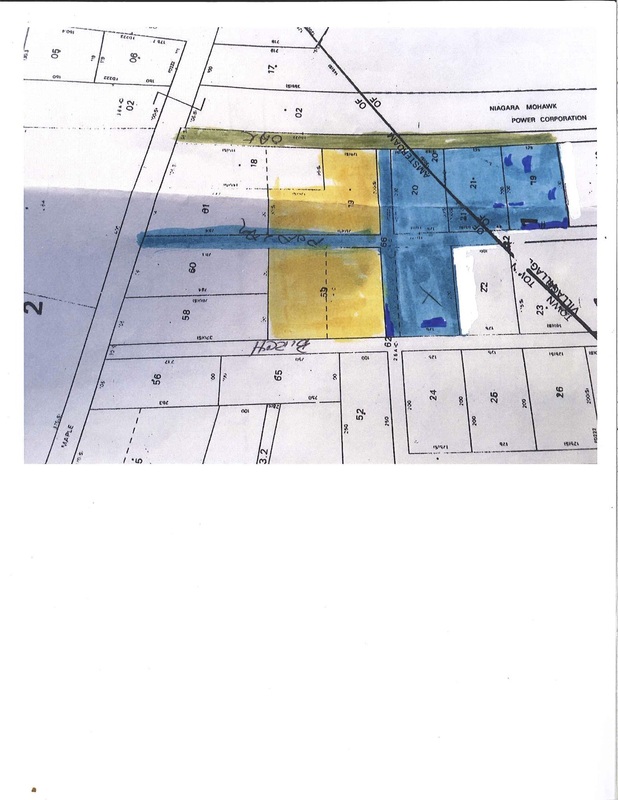 ​*Map above includes all the acreage. Lots 66, 20, 21 and 79 are all included in this sale. View Slide Show - A few new picts added! Owners are looking for an offer on this former home of the late Rex Maltbie, "The second most powerful individual in the huge rug-making enterprise"! This excellent condition Cape Cod style home is situated on a dead end street, and features large eat in kitchen with center island, that has seating for 5, and appliances included, (including a brand new dishwasher). Formal dining room off the kitchen and large living room with huge fireplace, (see the slide show!). Hardwood floors throughout, 4 good sized bedrooms upstairs, 1 full bath upstairs and another 1/2 bathroom downstairs. A nice sun room off the side of the house, a full basement and attic, a great back yard with big fire pit, (1.70 acres per deed), and a 2 car garage with loft and a brand new roof. Immaculately maintained Cape Cod style home situated on the top of Second Avenue with a 100' x 125' lot, as per deed. Home has a custom Carriage House eat in kitchen, formal dining room and a cozy living room with wood burning fireplace. 3 bedrooms upstairs along with a full bathroom and another bedroom on the first floor with a 1/2 bathroom with laundry hookups, (washer and dryer stay). Kitchen has a sliding glass door that leads out to a deck, all replacement windows, a new tankless water heater and a full, clean basement with work benches. 1 car attached garage with storage area, central air-conditioning and a shed on the property. This house will NOT last long on the market! Call to schedule your showing today! Spotless 1,800 sq. ft. manufactured home plus 24' x 24' garage all on 3 organic acres. Home features kitchen with appliances and oak faced cabinets. Dining room, or den, living room and utility/laundry room. 3 large bedrooms, 2 full bathrooms and extra storage/pantry room. Storage room and den could be office and reception area. Garage has one 24' wall of storage. Insulated chicken coop plus storage shed. One acre fenced pasture with run in. Property has apple, cherry and pear trees. All within 15 minutes on I-90. 4 year old roof, 5 year old furnace, a fenced, in ground pool and 2 car garage. Nice yard with state land adjoining on both sides and in Broadalbin Perth school district. A rare find with this 4 bedroom, 2.5 bath American Craftsman on a well manicured lot! Owners have integrated every imaginable upgrade like a new kitchen with custom concrete counter tops and stainless appliances, an elegant formal dining, large living room with hardwood floors and enclosed front porch. Home also has a beautiful entrance foyer with a half bath & a customized storage area that leads to a great In-law apartment, (or family room/office), all with radiant heat. First floor bedroom and 3 bedrooms upstairs along with a bath on each floor. And it also has a beautiful tiered deck with an above ground pool and a detached 2 car garage! Too many other upgrades to list, so call us for a showing! Just broke ground on this beautiful Stanton model! This house is a Colonial Ranch style home in the beautiful Mohawk Hills Community off of Route 5s in the Town of Florida. This particular model home features an open concept kitchen with appliances and granite counter tops and center island. Dining room and living room with gas fireplace, hardwood floors and cathedral ceiling in the living room. 3 bedrooms, including rear master suite with two walk-in-closets and it's own full bath, (2 full baths total). 9' ceilings, covered front porch, covered veranda, first floor laundry, full basement, 2 car garage with seasonal storage area. MANY models to choose from! Models starting at $232,200. ​Large Farmhouse situated on over 25 acres. Main house has kitchen with appliances, formal dining room, large living room, den, a 1/2 bath, (downstairs), and solarium, used as a family room.Upstairs has 3 bedrooms and 1 full bathroom. Separate in law apartment is in need of some repair and has kitchen, living room, 1 bedrooms and a bathroom with laundry area. 2 car garage, an older conventional style barn with silos in need of TLC. View Slide Show - Some new photos added! You won't be cramped in this sharp executive brick faced Contemporary that set on a 1 acre lot on a quiet cul-de-sac in the Town of Perth. Home has cherry kitchen with new appliances, a breakfast bar and eat in area. Formal dining room and oversized living room with fireplace and cathedral ceiling. 1st floor master bedroom with, office area, full bath and jacuzzi tub and shower, 2 more bedrooms on the 2nd floor and a bonus room could be a 4th bedroom. 1 1/2 bathrooms on the first floor and another full bath on the 2nd floor. 1st floor laundry room with tile floor, a full basement that could be converted, central air and central vacuum. Heated in ground pool that is totally fenced in, storage shed, great yard and an attached 2 car garage. Broadalbin Perth schools. Absolutely stunning Cape style home situated on 1.80 acres of park like property. Home features a chefs dream Maple kitchen with top of the line appliances, including a 6 burner commercial stove and a GE Monogram refrigerator/freezer. A large 4' x 11' island, all granite countertops and a tile floor with radiant heat. Formal dining room with hardwood floors, a formal living room with pellet stove and huge family room with a gas fireplace. Sun room off of the family room, a rec. room with custom built bar, pool table, build in Dolby surround sound and hardwood floors. Nice office and 1/2 bathroom, mud room and laundry room, (washer and dryer included), also on the first floor. 2nd floor has a master suite with sitting area, a gas fireplace, nice windows overlooking the back yard and pool and it's own full bathroom with whirlpool tub and custom built in tiled shower. 3 more bedrooms, (another with it's own full bathroom), and another full bathroom on the 2nd floor for a total of 3 bathrooms upstairs. Basement is finished into another nice family room with built in's and a great gym area with a pellet stove, (ask about available furnishings in the home). 3 car garage, a shed and beautiful fenced in in ground pool with it's own pool house.